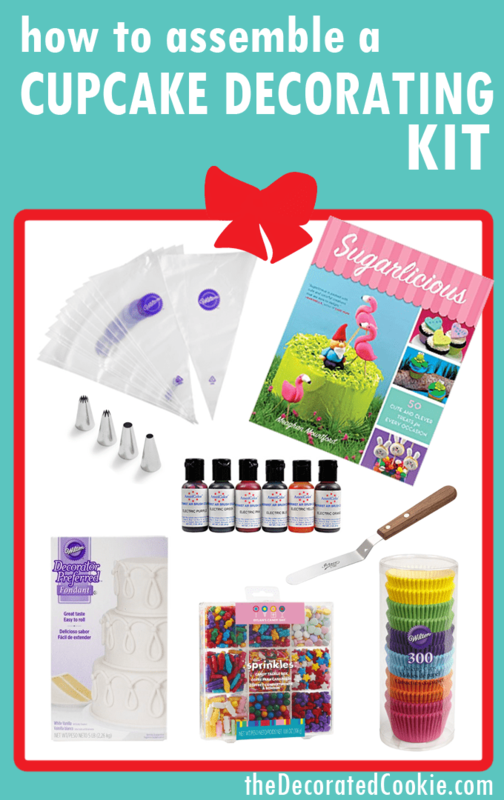 Holiday gift guide: Assemble a cookie decorating kit, cupcake decorating kit, or marshmallow decorating kit. Great gift for kids or grown-ups who love to bake and create fun food. 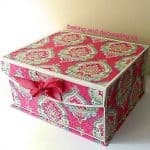 Recently, a reader contacted me about putting together a cupcake decorating gift for her daughter-in-law (a moment of awww… for the awesome mother-in-law). I’ve put together kits before for my niece, an aspiring food artist, namely this cookie decorating kit and this cupcake decorating kit. Kits you assemble yourself are such thoughtful gifts for others. 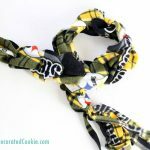 In the exchange with this lovely reader it occurred to me that others might want to assemble decorating kits for their baker friends and family. And they might not know what to buy. And I do know what to buy. So I gathered up all my favorite tools for you to package for your friends and families and they will love you forever and ever. I am a member of the Amazon affiliate program, which means any purchases you make from the links in this post, I receive a small percentage. That said, I’ll still only link to products I use and love. I just get a little kick back. And you need to know that. Also note, many of the items on the list will be available in your local craft store. First of all, you should really include my book in every single kit you give. (Ahem.) And with any gift you give. And maybe you can roll it up and put it in every stocking. And pass it out to people on the street. 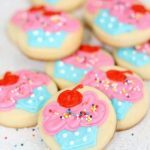 The book has everything you need to know to decorate cookies, cupcakes, cakes, cake pops, marshmallows and more. It’s called Sugarlicious. And it’s sugarlicious. 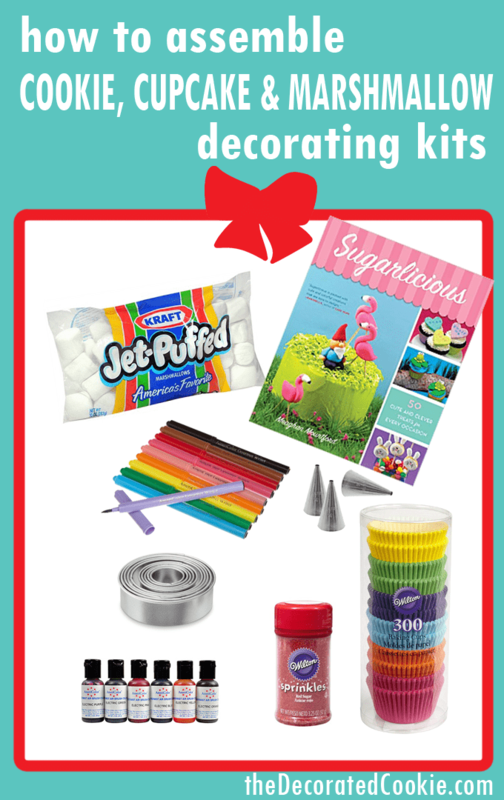 Below, find how-tos for assembling a cookie decorating kit, cupcake decorating kit and marshmallow decorating kit. Any cookie decorators in your life? Or anyone wanting to try cookie decorating? 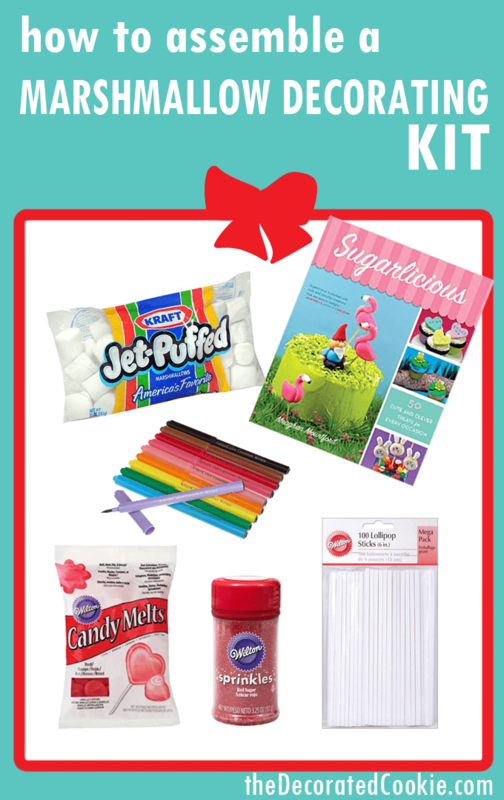 Here are the supplies they will need so you can assemble a cookie decorating kit. I also included a couple other cookbook suggestions, in addition to my own. Optional items: Parchment paper to line trays, mixing bowls, pot holders, baking trays, apron and spatulas. 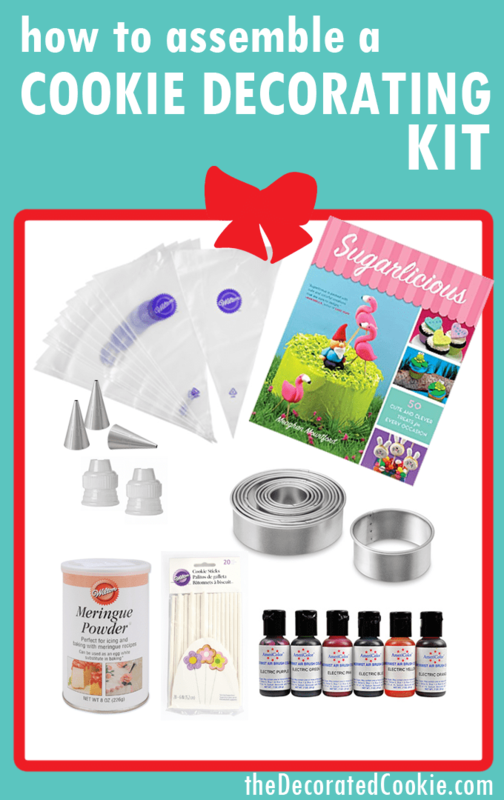 Here are some supplies to assemble a cupcake decorating for anyone interested in baking lots of cupcakes. I suggest larger-size disposable decorating bags to hold more frosting. When cupcake decorating, I rarely use couplers, which are a tool that allow you to change tips on a bag, because I usually decorate a batch of cupcakes with the same color and style of frosting. But if you’d like to include some, find the link above in the cookie decorating section. Just be sure the tips you choose fit the couplers. That is, make sure you choose a standard size tip to fit the standard coupler, not the extra large tips. The fondant is also optional, but making fondant cupcake toppers is a good next-level for cupcake decorators. Optional items: Sprinkles, mixing bowls, cupcake pans, apron and pot holders. The most popular ways to decorate marshmallows are to dip in candy melts and decorate with different sprinkles and candy eyes, to dip in water and then coat in sparkling sugar, and to draw on marshmallows with food writers. I provide a few links for different sprinkles, but you can really choose whichever colors and styles you like. You don’t need to get every color of candy melts and every color of sprinkles. If you’re only going to pack one set of food writers, opt for the Americolor Gourmet Writers.